Not that noisy at all, it makes a little ruckus but the slow speeds ensure that the noise is more than just bearable. 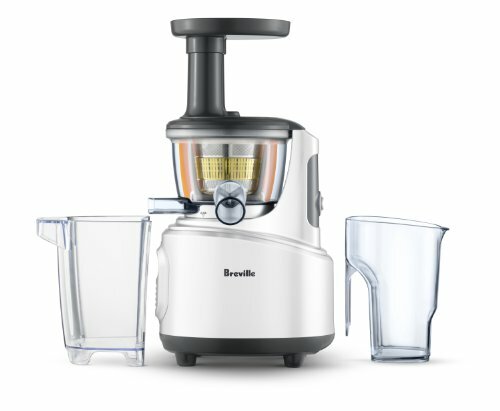 The Breville BJS600XL is a masticating juicer with a vertical design. Moving away from its lineage of centrifugal juicers, Breville attempts at delivering a high quality masticating action juicer to the public and in the process try and usurp Omega’s image as the best. Because of its slow speeds, this juicer is capable of tackling low liquid content ingredients such as leafy veggies, drier fruits and more. Regardless of what you juice, the yield is always high. It does carrots, wheatgrass, berries and apples together without ever wincing. Once done, the cleanup is just as easy with a safe start system to ensure all parts are locked before beginning, direction control to remove clogs and overload protection to cease operations in case the motor gets too hot. Instead of the conventional horizontal masticating design, Breville has opted for a vertical and compacter style keeping the consumer in mind. This makes it easy to fit on the counters or even store it in cabinets. Moreover, it helps make the juicing jug and pulp collector detachable for easier storage. 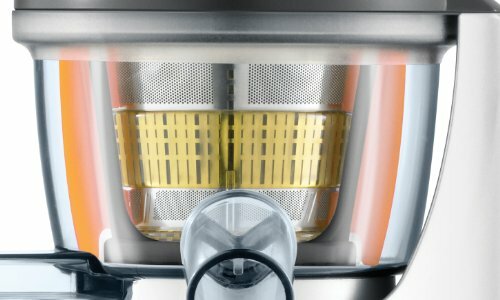 Honestly, when we received our Breville BJS600XL for review, we expected something unique considering how Breville mostly deals in centrifugal juicers. To our astonishment, the BJS600XL is an exact replica of the Omega VRT350! Yes, other than the Breville stamp and color combination it is exactly the same. We already had the VRT350 tested prior to getting this juicer and upon side-by-side comparison, the performance and looks all match. Digging deeper, we found that the two models although from separate manufacturers are built in the same Chinese factory! Well that explains how Breville managed to produce a masticating juicer! Moving on, we did everything that we tried with the Omega VRT350 and other than coming out slightly on top with kale and wheatgrass, the performance, yield and juice quality as exactly similar. All-in-all it really doesn’t matter if you purchase the Breville BJS600XL or the Omega VRT350 – they are one and the same. 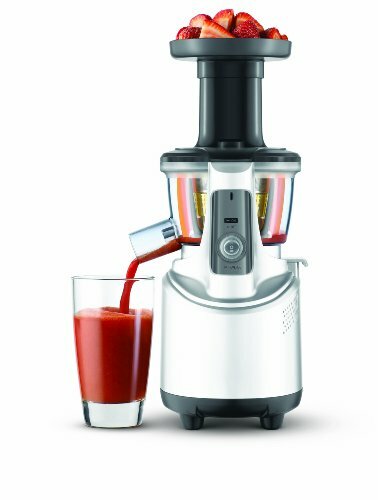 Normally we tend to give any juicer that needs a lot of slicing and dicing prior to juicing a poor 3 star rating but because the Breville BJS600XL doesn’t clog or slow down midway once ingredients are diced up to half inch size, we felt it wasn’t something to complain about. Moving on, overload protection and dual direction movement of the auger both ensure that you don’t have to worry about the juicer once your operating it. Pulpy or ripe fruits, leafy veggies and low liquid content fruits can all be juiced separately or together irrespective of the mixture. Add a bit of water and let it slowly clean itself up. Make sure to operate it in both directions for a good two minutes with water running through so that it removes any residual pulp stuck inside. This is all it takes for post-juicing cleanup. Once a week, do remember to dismantle it and scrub or dishwasher clean all parts other than the base. Juice quality is at par with all masticating juicers. The foam presence is minute and is what would be expected from an expensive juicer. Overall, any juice you prepare will lack foam and froth, taste better almost like fresh juice even three days after. This is one particular area where we were stumped because the VRT350 actually produced about 70ml more in the first run and a rerun with the pulp gave another 13ml of juice. On the other hand the Breville BJS600XL being exactly similar felt short both times! Well 70ml isn’t much but it is still an alarming drop when the entire unit appears the same. Nothing much to discuss here since it operates at 80RPM in either direction. Because it juices everything we feel it is powerful enough to deserve full marks. Not that noisy at all, it makes a little ruckus but the slow speeds ensure that the noise is more than just bearable. Remember though to not run it close to your bedroom, if your kitchen is nearby as it still does have that nagging clamor when doing hard veggies or fruits. The Breville BJS600XL Fountain Crush Masticating Slow Juicer might be an attempt by the company to woe non-centrifugal consumers over to their side but trying to use Omega’s design and technology to do this doesn’t leave a good impact. Nevertheless, if you find both the Omega and Breville priced equally, choosing this really doesn’t matter. Reliable, great juice quality and compact footprint, it’s a good purchase but could have been better had it been slightly cheaper. Pros: Vertical masticating design, limited footprint, good juice quality. Cons: Exactly similar to the Omega VRT350, slow and minute feed chute. Masticating mechanism works great with soft veggies and fruits. Filter basket helps in auto purification and eliminates difficulties in cleaning while maintaining maximum yield. Dual direction control, works in either direction and helps free up clogs. Limited type 1 year warranty cover on the entire unit.